Earlier this month, fast food workers in the Fight for $15 walked off their jobs in 150 cities throughout the country. Here in Chicago, workers at McDonald's, Taco Bell and more left work and engaged in civil disobedience in front of the McDonald's at 87th and State Street. Nineteen protestors were arrested, and they were joined by figures such as State Representative Luis Gutierrez and U.S. Representative Jan Schakowsky. 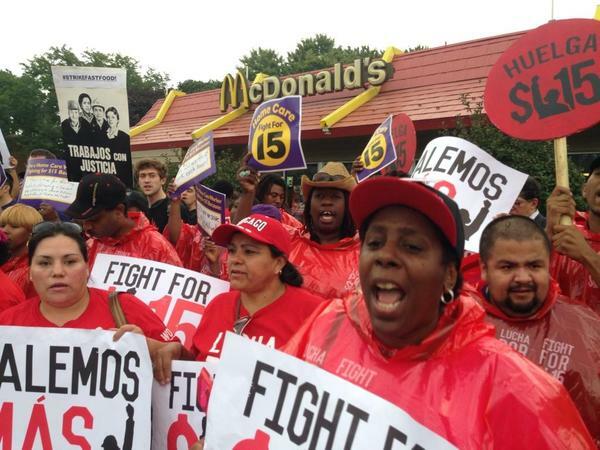 Fight for $15 is a national movement of workers in the service sector, mostly in the fast food industry. Their main demands are a $15 minimum wage and the right to form a union. The Fight for $15 movement represents the latest chapter in the long American tradition of social movements -- the labor movement in particular. In 21st century America, societal faith in the power of collective action seems to have given way to cynicism and doubt in the political process. If it achieves some measure of success, the Fight for $15 has the potential to remind the country of the power of grassroots movements in an age where apathy often wins out over action. As Americans, we often take for granted many of the gains of the labor movement without considering how hard-fought and controversial they were at the time. And now, many of the movement's wins are being (or have been) eroded. For instance, if the minimum wage kept up with inflation and worker productivity, it would be over $21 today. Here in Chicago, Fight for $15's demands are sorely needed. MIT calculates that the living wage for one adult working full-time with two children in Chicago is $25.51 an hour. For two adults with two children, the living wage is $20.35 an hour. Yet the minimum wage in Illinois is currently only $8.25, which MIT defines as below the poverty wage for an adult with any dependents. On top of this, employers often are unwilling to even hire full-time workers (and thus be forced to provide employee benefits), making the struggle to get by all the more perilous. Put into this perspective, the demand for a $15 minimum wage does not seem so unreasonable at all. Rather, what is supremely unreasonable is that members of our community live in poverty, at the risk of losing their homes or being unable to put food on the table, while working full-time or multiple part-time jobs. Chicago is a city that has always played a central role in the labor movement -- with the Haymarket Riot being the most infamous example -- and the Fight for $15 is no exception. Their recent civil disobedience action is the latest in a variety of tactics the movement has used here and throughout the country to maintain media attention and keep the fast food industry on its toes. Seattle recently made history by raising the city's minimum wage to $15 without national or corporate action. Chicago should be a leader on this issue and do the same. And while Republicans in Washington today can seemingly never get enough of hacking away at the social safety net, raising the minimum wage could not be more urgent both locally and nationally. It is shocking that in a country that touts itself as a beacon of equality to the world, hard working families cannot make ends meet. A living wage is a basic human right. If as Americans we wish to uphold Dr. Martin Kings assertion that "the arc of the moral universe is long, but it bends towards justice," the US simply must enact a living wage. In the meantime, Chicago should take this step locally. The Fight for $15 movement is calling on us to take a giant leap toward equality and it cannot be taken too soon. Editor's Note: A previous version of this piece said Rep. Jan Schakowsky is a state representative. She represents Illinois' Ninth District in the United States House of Representatives and the piece has been amended to reflect that.